On the eve of World War II and within days of becoming Prime Minister of Great Britain, Winston Churchill (Gary Oldman) faces one of his most turbulent and defining trials: exploring a negotiated peace treaty with Nazi Germany, or standing firm to fight for the ideals, liberty and freedom of a nation. As the unstoppable Nazi forces roll across Western Europe and the threat of invasion is imminent, and with an unprepared public, a skeptical King (Ben Mendelsohn), and his own party plotting against him, Churchill must withstand his darkest hour, rally a nation, and attempt to change the course of world history. 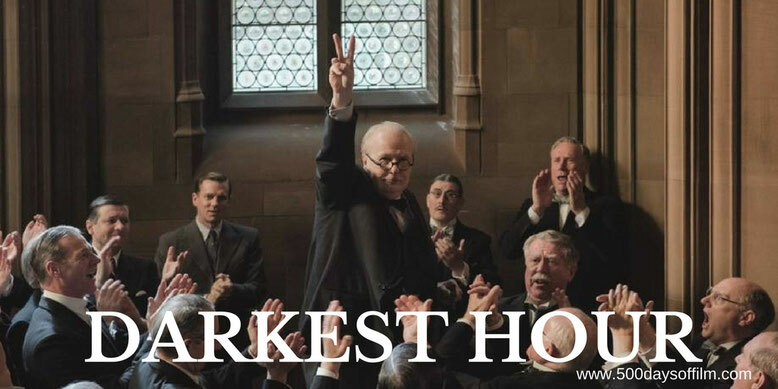 Anchored by a superb, transformative performance from Gary Oldman (complete with incredible facial prosthetics), Darkest Hour tells the remarkable story of three turbulent weeks in May, 1940. Following the resignation of Neville Chamberlain (Ronald Pickup), Winston Churchill finds himself as a Prime Minister tasked with an incredibly difficult decision - whether to fight Hitler “to the end” or negotiate a peace deal. Joe Wright’s handsomely directed film (written by Anthony McCarten) stays focused on Churchill’s plight during those three weeks. A sensible move as this enables Darkest Hour to build real tension and explore just how isolated and unpopular Churchill was - even within his own party. There has been no shortage of Churchill portrayals in film and television. However, none capture the man like Gary Oldman. As is his wont, he disappears into this role - perfectly capturing Churchill’s mannerisms. He imbues his performance with powerful flashes of frustration and despair alongside occasional touches of impish charm. Oldman’s mastery of his prosthetics is also impressive. This is a skill that cannot be overestimated and, thankfully, his makeup and hair do not let him down. Indeed, Darkest Hour is supremely confident in its prosthetics. We see many close-ups of Churchill eating, drinking, smoking and, as the trailer above shows, blowing out matches. While Oldman’s performance is the best thing about Darkest Hour, he is well supported by the rest of the film’s cast. Stephen Dillane is formidable as Viscount Halifax and Ronald Pickup is perfect as the ailing Neville Chamberlain. Meanwhile, Lily James is a warm screen presence as Churchill’s secretary, Elizabeth Layton, and Ben Mendelsohn is wonderful as King George VI. However, the only character that comes close to rivaling Oldman’s charismatic performance is (unsurprisingly) Kristen Scott Thomas’s Clemmie. I wish the film had devoted more time to her - she is truly captivating with an intriguing story of her own to tell. Indeed, I would far rather have seen more from Clemmie than watched the scene on the tube towards the end of Darkest Hour. I found this sequence jarring and baffling - particularly as it appears to have no basis in fact. This rather ill judged scene broke the tension in Darkest Hour at the exact time when it should have been at its height. Indeed, it was quite an effort to get back on board with the film afterwards. Fortunately, the movie saves some of Oldman’s most powerful work for last. In Darkest Hour, Joe Wright has made an enjoyable film with a brilliant central performance - a movie that reminds us of the impossible decisions that had to be made at a truly dark time in world history. Have you seen Darkest Hour? If you have, what did you think of Joe Wright’s film? Let me know in the comments section below or via Facebook or Twitter (@500DaysOfFilm).